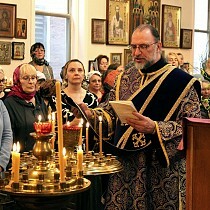 We, the clergymen of the over 100 parishes, monasteries, and missions of the Eastern American Diocese of the Russian Orthodox Church Outside of Russia, having gathered under the sacred eaves of St. Alexander Nevsky Diocesan Cathedral in Howell, NJ, having prayed before the wonderworking icon of the Mother of God "Softener of Hardened Hearts," and having communed of Christ’s Holy Mysteries at the Liturgy of the Presanctified Gifts which we celebrated together, led by His Grace Nicholas, Bishop of Manhattan, greet the monastics and laity of our Diocese with heartfelt wishes for all to fruitfully traverse Great Lent and joyously greet the Pascha of Christ. Beyond the salvation of our God-loving flock, one of our primary concerns is the grave situation of our fraternal Ukrainian Orthodox Church, headed by His Beatitude, Metropolitan Onufry, which is suffering persecution at the hands of the government and nationalist forces. 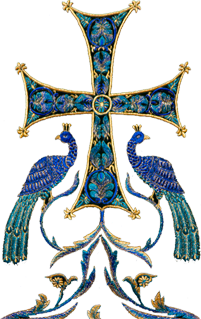 We grieve for the archpastors, our brother-pastors, the monastics and laity, who together are recognized throughout the Orthodox world as the canonical Ukrainian Orthodox Church. We extend a hand of support to them, lift up our fervent prayers, and call upon politicians in the Ukrainian government to cease this lawlessness, and upon governmental institutions in the U.S. and international human rights and religious freedom organizations to examine the situation of the Ukrainian Orthodox Church without prejudice, and to influence the situation in a positive direction. Having heard a report by Archimandrite Roman (Krassovsky), Chief of the Russian Ecclesiastical Mission in Jerusalem, with numerous questions and personal discussions, we piously "honor his sufferings and labors" and lovingly embrace the spiritual struggle of those who serve in the Holy Land. Our clergymen and monastics humbly guard and preserve the holy sites on the Mount of Olives, Russian Gethsemane, Bethany, Ein Fara, and other places, show pilgrims from around the world warm hospitality, and worthily represent the Russian Church Abroad before the hierarchy of the Jerusalem "Mother Church" and the civil authorities. We rejoice that a large group of pilgrims headed by Bishop Nicholas of Manhattan will head to the Mount of Olives in time for the patronal feast day celebrations of our Convent of the Ascension of the Lord. We ask His Grace to pray for us and our parishioners at the Life-Giving Sepulcher of the Lord, at Golgotha, and at other holy sites, and to express our words of support and brotherly love to the clergy and monastics of mission headed by Fr. Roman, and to all those who labor at the holy sites. We ask the parishioners and worshippers of our churches and monasteries of the Eastern American Diocese to open their hearts and generously donate for the needs of the Russian Ecclesiastical Mission of the Russian Church Abroad in the Holy Land. Our churches will be holding our traditional plate collections during All-Night Vigil and Divine Liturgy on the great feast of the Entry of the Lord into Jerusalem. We receive with profound joy the election, confirmation, and consecration of His Grace Luke as Bishop of Syracuse, vicar of the Eastern American Diocese. We wholeheartedly join the wishes expressed by the First Hierarch of the Russian Church Abroad during his words of guidance as he entrusted His Grace with the archpastoral staff. We pray for the bestowal of Heavenly aid and blessed successes upon His Grace, Bishop Luke, and his monastic brethren, and upon the teachers and students of Holy Trinity Seminary in Jordanville. We thank His Eminence, Metropolitan Jonah, who is living in retirement within our Diocese, for his support and participation in this retreat. In conclusion, we bow deeply with gratitude toward Australia, where His Eminence, Metropolitan Hilarion of Eastern America & New York, is spending the blessed Lenten period, ministering to the clergy, monastics, and laity of the Diocese of Australia & New Zealand. We share a common helmsman with that diocese, who wisely and steadily guides our church life and the pastoral service that has been bestowed upon us sinners. May the crucified and resurrected Christ, the Giver of Life, bless and strengthen us, especially those in difficult circumstances and tribulations, as they carry forth their spiritual struggle during these days of preparation for the salvific Pascha of God!